Your garage door contributes greatly to the look and feel of the exterior of your home. However, many homeowners choose garage doors that are painted in neutral colors and made up of basic designs. Why settle for that when there are so many fantastic options at your fingertips? While once upon a time, garage door options were limited, there are now endless choices for colors, sizes, designs and insulation options. Whether you add a panel design or decide to repaint, you have a myriad of choices available to you. 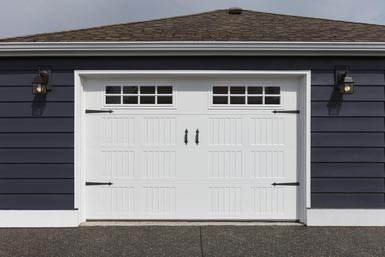 Upgrading your garage door can make a big impact on the look, feel, and efficiency of your property. However, before you start choosing a color scheme, make sure you select what type of garage door works best for you. Adding windows can be a great way to increase natural light if you use your garage as a workstation, yoga studio or other alternate living space. You may also want to consider faux swinging stable doors, made out of solid materials like steel, which appear to swing, but actually operate up and down just like standard doors. Insulation options should play a key role in your choice of garage door. It’s important for many homeowners to keep their energy costs in check, and insulating your garage door can make a huge difference. You can tell a door’s insulating power by the R-value. A higher number means higher-quality insulation, reduced outside noise and a quieter opening sound. Don’t assume that thicker doors have higher quality insulation than others. Polyurethane is one of the best insulators and surprisingly thin. Better insulation can also lead to a stronger door, which helps deter burglars and thieves. Garage doors are heavy and can cause severe injury if not regularly maintained and approached with a safety-first mentality. Choose a pinch-resistant door that physically moves fingers if they get too close, or one with a tamper-resistant bracket to prevent injuries. Test the auto stop features regularly by placing a brick beneath the door and making sure the door stops or lifts when it detects an object. When it comes to garage doors, one size does not fit all. Be sure to consider all of your aesthetic and practical preferences in order to choose a door that’s beautiful, safe and efficient.